The AWARD WINNING, dementia assistance cards, and labels provide a clear, concise way for someone with dementia or memory loss to ask for help in public. The cards share the name and contact number of a relative, friend, or care home, in the event of an emergency. 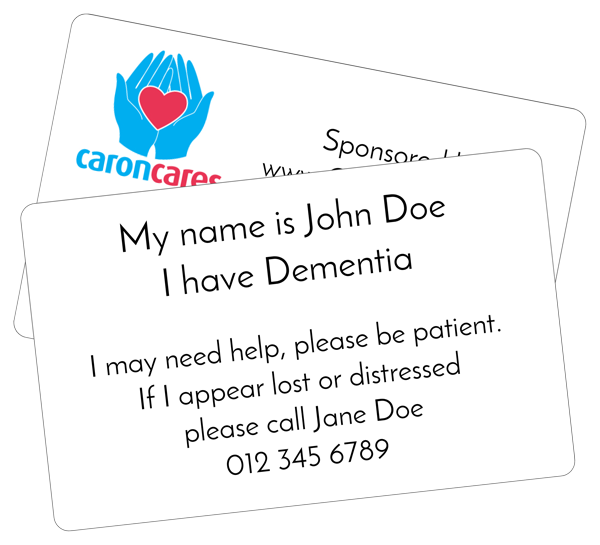 Carer's cards are also available, discreetly explaining, the person they are with has dementia. FREE TO MAKE AT HOME and I can make them for you. I charge £12 for 4 personalised ones, 2 designed for key fobs, lanyards(included), handbags etc and 2 for wallets. I also send 2 carers cards. Price includes P&P. Please contact me for payment details. Email caroncares01@gmail.com with the name of the person with dementia, the name of the emergency contact and their number. Lastly, I need the address to post them to. They are editable online, available 24/7 and have been translated by volunteers, into 10 other languages. These cards are receiving amazing feedback from people with dementia, their relatives, and the emergency services, a donation is always welcome but never expected. This project was self-funded. Your data is not collected nor shared to third parties. To create blank cards just hit the create button. We also have a Facebook page, please like and join us. Please support our work by making a small donation.